At a town hall, protesters accused the mayor of breaking a campaign promise to end the controversial policing strategy. By Malcolm Burnley·	 5/2/2016, 12:39 p.m. Some media outlets described Friday’s town hall on stop-and-frisk as “raucous” or “chaos.” But that’s only a half-truth. Sure, there were emotional eruptions by the audience, defiant answers from the police commissioner, and angry constituents jeering the mayor. But in spite of the high tensions, the event co-hosted by the interfaith group POWER and Techbook Online largely did what it set out to do: clarify where each of the key players stands on stop-and-frisk. Not that audience members necessarily got the answers they wanted. Roughly 400 people crammed into New Vision United Methodist Church in North Philadelphia to listen to two moderators question several panel members, including Mayor Jim Kenney, Police Commissioner Richard Ross, Pennsylvania ACLU deputy legal director Mary Catherine Roper, City Solicitor Sozi Tulante and Police Advisory Commission executive director Kelvyn Anderson. 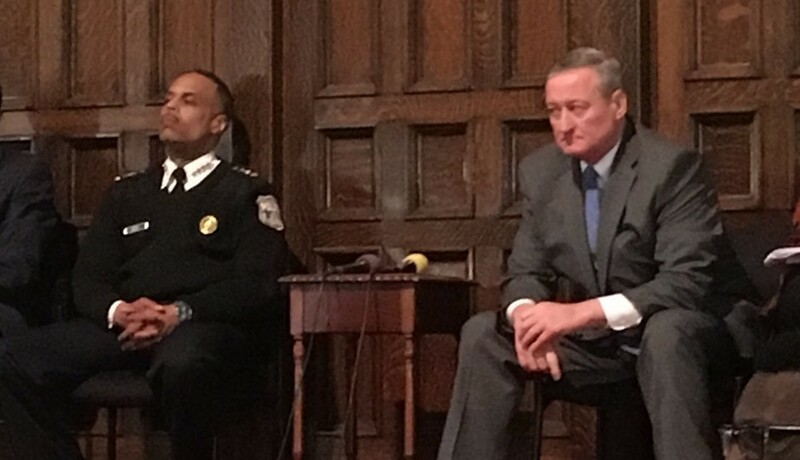 Journalist-activist Chris Norris asked Kenney the first question: Was he willing to apologize, on behalf of the city, for the number of unconstitutional stops made of Philadelphians (estimated to be about one-third of the roughly 200,000 stops made by police a year, according to the latest data)? “Understand the fact that I’ve been there since January 4th of 2016. Taking that into account, anyone who’s had an unconstitutional interaction with a police officer, I do apologize for that,” Kenney said. Many critics at the town hall accused Kenney of backtracking on a campaign pledge to end stop-and-frisk. Over the past few months, Kenney has vehemently argued that his stance hasn’t changed since March of 2015. That’s when, in the middle of the mayor’s race, he released a policy paper detailing how he would change the controversial policing practice if elected. He said he explicitly defined “stop-and-frisk” in the paper as unconstitutionally stopping citizens without reasonable suspicion. “I think that we have held up our promise to end this unconstitutional practice and to make sure, on a long-term basis, we can aspirationally get down to zero unconstitutional stops,” Kenney said on Friday. However brief, the answer was a revealing pivot from what Ross and Tulante had said just a month ago. Then, they reportedly claimed that the city had no authority to raise the threshold permitting police officers to stop pedestrians because of the 1968 Supreme Court decision in Terry v. Ohio. On Friday, though, Tulante said the police department can, in fact, raise the standard (as the ACLU has been claiming for weeks), but that doing so would be detrimental to policing. “It impedes the ability to investigate crimes, because you need the lower standard to determine whether a crime is occurring,” said Tulante. “If you need probable cause, that’s not going to happen.” The city solicitor also said that he hasn’t been able to to find a single police department in the country that has raised its threshold for pedestrian stops. Ross responded, “First of all, I take issue with your white supremacy thing … ” before yelling from the audience rendered the last few words of his comments inaudible. Then, organizers attempted to restore order during an impromptu 20-minute intermission. It’s rare to witness a public event with so many overlapping contentions. The panelists sparred with the moderators, while the audience members bickered with each other as well as the panelists. Although it might seem hyperbolic to say that the repeated barbs thrown at Kenney on Friday could signal that stop-and-frisk will come back to haunt him in the 2019 mayoral election, there was a small acknowledgement from the mayor himself that the issue isn’t subsiding anytime soon. “If you’re upset with me because you think I walked back on that issue and you’ll never vote for me again, then I’ll totally understand that. I’ll totally understand,” Kenney said.